Redwood Plastics has sold thousands of outrigger pads over the years providing a solid, stable and safe platform for crane operators, concrete pumps and picker trucks. They have proven their worth to many industries time and again as they do not rot, rust, or support mold growth and are extremely strong. But outrigger pads are valuable for the public consumer as well, not just heavy industry. Redco™ RV outrigger pads provide the same safety and stability afforded to heavy industry to your own recreational vehicle. They are made of the same UHMW engineering plastic as the larger pads; however, you might be surprised at how affordable they are. 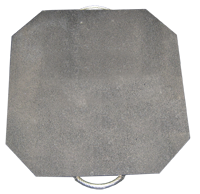 RV pads are usually 12″ x 12″ with 1″ thick material being the standard. Because the pads are smaller and thinner than our heavy-duty outrigger pads – they are proportionally cheaper than what those heavy equipment operators pay. All it takes is the failure of one wooden pad to cause very expensive damage to your RV or even worse, possible injury. One set of Redco™ RV outrigger pads should last the entire period you own your RV. Compared to the cost of your RV – Redco™ outrigger pads just make sense. Check out our PDF brochure HERE.